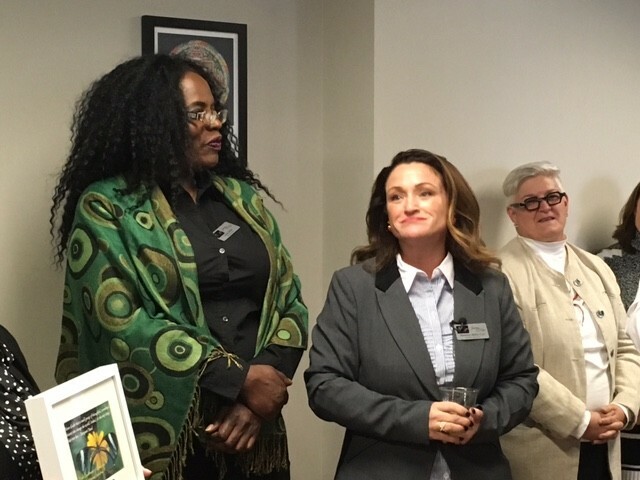 On Thursday Nov. 4, 2015 the long-cherished dream of a group of women with decades of experience working in the Utah Department of Corrections—or, in some cases, experience as inmates—finally came to life with the launch of Journey of Hope, a peer mentoring program that has already had some success in helping women avoid the cycle of re-incarceration. Journey of Hope is filling a crucial gap in services provision by the state, nonprofits and advocates. Staff works directly with women faced by challenges including addiction, abuse trauma and the knotty complexities of the judicial system. The program takes a gender-responsive approach—that is, it provides services needed specifically by women. Judging by some stories told during the opening, JOH's tiny staff of two has already made inroads. Some who became clients when they were released from prison or jail now mentor other women, in hopes of keeping them from from incarceration. In a small, crowded office just off 900 South in midtown Salt Lake City, social workers, UDOC employees, advocates and other supporters gathered to hear founder Shannon Cox and Journey board president Leslie Miller talk about why mentoring women on probation, at risk for incarceration and survivors of trafficking was a personal commitment they had made to themselves and the women they worked with when they were both UDOC employees. Cox was a 20 year Adult Probation & Parole veteran until she retired. Miller left Corrections six years ago and is now an advocate with Utah Coalition Against Sexual Assault. Miller told the room that JOH had been for her longtime friend Cox a dream: "One Shannon had never let go of." Miller recalled that when she first came to the UDOC, other officers told her not to work with inmates in the women's prison, because "they cry, they're manipulative." But while working for Adult Probation & Parole, she says, "I fell in love with working with women, with their resilience." She continued, "If you fix women, you fix the world, and everything else falls in place." Cox started JOH in a double-wide trailer round the back of the Orange Street halfway-house several years ago. Since then, it's grown. Now it provides mentoring services, and offers a bridge to services that aim to keep women from returning to prison or jail. Miller said it's not simply a case of talking and listening to the women and addressing their transportation issues. It's also about working on, and finding, those who can help the women with all kinds of issues: finding housing, getting medical and substance-abuse treatment, and dealing with the demands of parole and probation. A former inmate, Jeanie talked about how she "hated cops," but after she was released and began working with Cox, mentors and a therapist, she now mentors 10 women having struggles with the justice system. Another former inmate who had done "a long stretch" is Barbara Curwin. That prison "was my home," she says. "Either you let it do you, or you do it." When she left prison, her housing captain told her she needed to find "a sober living house that was not $600 a month." Since moving into a sober living facility, when she's not at her 40-hour-per-week plumbing job, she's mentoring her housemates. Leaving prison, Curwin said, she knew she could be thought of being institutionalized, but chose "not to come out this way." She acknowledged that "a lot of my mentors were ones in blue," along with trafficking survivor advocate Gina Salazar, who has volunteered to coordinate mentors. Salazar and Curwin knew each other in prison, the latter recalled.